Can My Horse Make Me Sick? Can you catch sickness or diseases from horses? The answer is yes, there is a very small risk that you could catch an illness from your horse. But the instances of a human actually being infected by a horse are rare. West Nile Virus and Eastern Equine Encephalitis made headline news. Both viruses affect humans and horses. Horses and humans are not hosts to the virus. Both WNV and EEE are transmitted to horses and humans (and other animals) by mosquitoes. Mosquitoes bite birds infected with these viruses and transfer them to horses and humans. The hosts for WNV are birds such as jays, ravens, and crows. Wild fowl are the host for EEE. You can not get EEE or WNV from your horse, even if it has been infected. Horse owners who live in areas where EEE and WNV are prevalent should get their horses vaccinated. Both diseases are can be fatal to the horse and the best protection is the vaccination. Your veterinarian can recommend when and how often you should vaccinate. You can also help to protect yourself and you horse by taking steps to reduce and avoid mosquitoes. In 1994 several horse handlers in Australia became ill after working with horses with pneumonia like symptoms. The infection was found to be caused by equine morbillivirus, and renamed Hendra Virus. Hendra Virus is felt to be transferred through bodily fluids. Handlers came in contact with blood, mucous or feces of the sick horses and were themselves infected. The host for HeV is a fruit bat or ‘flying fox’ native to Australia. But horse/human transfer of infection like this is rare. Veterinarians and meat handlers are most at risk. Anthrax is well known in connection with biological warfare. Yet anthrax poisoning due to livestock is unlikely. According to the Center for Disease Control and Prevention no human incidences of anthrax occurred from any source in 2000 although 53 cattle farms were quarantined for anthrax. Rabies can affect the nervous system of all mammals. Usually the transmission is through a bite, where saliva will enter the open wound. Horses with rabies will be unusually nervous, have seizures, and be uncontrollable. Death soon follows. Horses should be vaccinated for rabies as recommended by your veterinarian. According to reports from the Center for Disease Control there were 51 cases in 2001 of horse, donkeys or mules rabies in the United States. There was one human case and it was not equine related. In Canada only 10 horses had rabies and no human cases were reported. Ringworm is a caused by fungi, is very contagious but isn’t truly parasitic as the name suggests. It is possible to get ringworm if you’ve handled a horse (or other pet) with the condition. Ringworm appears as round red patches that are scruffy and itchy. Mange is a skin condition caused by small mites that borrow under the skin. Horses can get two types of mange; one that burrows into the skin and one that lives on the surface. The mites can bite humans, causing an itchy weal. Lice are sometimes seen in poorly kept crowded conditions. Humans are not hosts for the lice that affect horses although you could get bitten. If you suspect your horse has mange or lice, call your veterinarian for recommendations. With all parasite and skin conditions be scrupulous about your own hygiene and ask your vet about precautions you can take to prevent human transfer. Wash your hands after grooming, hoof-picking, or mucking out. While allergies aren’t really something you can catch from your horse, they can make being around horses less fun. 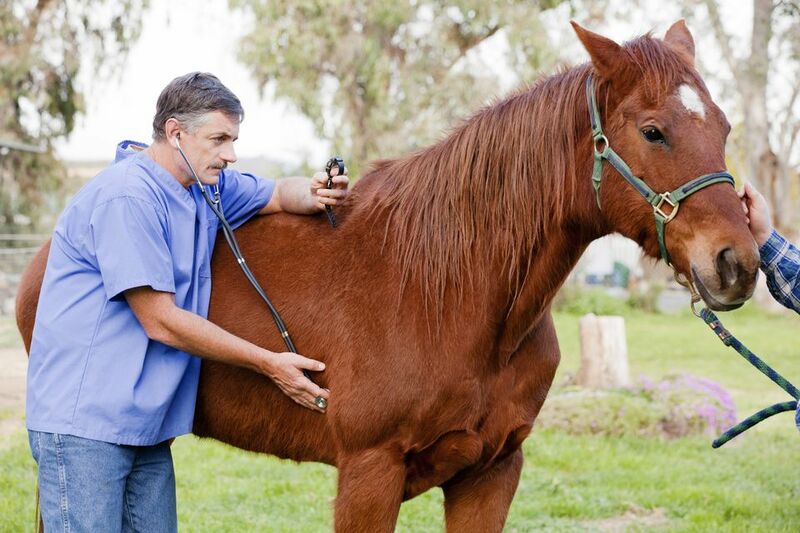 If you are allergic to your cat or dog, you could be allergic to your horse. Horse’s have skin dander just like other furry pets. If allergies flare up when you enter the stable, the dusts and molds from bedding and hay could be the culprits. Unfortunately, it is impossible to completely remove all dust and molds from barns so consider saddling up outdoors. Try wearing a mask while working in the stable. Grooming your horse may stir up irritating dirt and dander. Wear a mask and consider asking someone without allergies to help out. Some breeds may be less likely to cause allergic reactions. The Bakshir Curly is a breed favored by those who want to enjoy horses but have allergies.